N Word Origins by Pandora Word Box links Medicine and Biology with Humanities, Arts and Sciences. 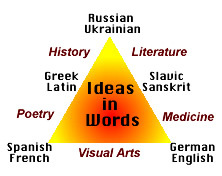 The goal is to stress "Ideas in Words", to be entertaining and replace memorization by a better grasp of meanings. Grasp of word roots and visual fine arts enhances verbal reasoning, and we hope, will help boost verbal and vocabulary proficiency as measured by MCAT LSAT CAT SAT scores and other college tests and entrance examinations. Medword.net is a companion website of PandoraWordBox.com. Medword.net highlights and illustrates ideas in medical words "in brief".